The US has formally sent to trial five suspected al-Qaeda militants believed to have planned the 9/11 terror attacks. The five Guantanamo Bay inmates, including alleged mastermind Khalid Sheikh Mohammed, will be tried by a military commission. They will face charges including terrorism, hijacking, conspiracy, murder and destruction of property. They could face the death penalty if found guilty, the Pentagon confirmed. Khalid Sheikh Mohammed and the four others - Waleed bin Attash, Ramzi Binalshibh, Ali Abd al-Aziz Ali and Mustafa Ahmad al-Hawsawi - are expected to be tried together, the Pentagon added. They are accused of planning and executing the terror attacks of 11 September 2001, which saw hijacked planes strike New York, Washington and Shanksville, Pennsylvania. A total of 2,976 people died in the attacks. I was one of the handful of journalists present when Khalid Sheikh Mohammed, or KSM as he became known, was first charged under the Bush administration. On that day, the defendants and lawyers' voices were cut off mid-flow whenever the US military judge deemed they were divulging classified information. That happened at any mention of their treatment - including "waterboarding". KSM was slim with a full beard and apparently vain. With no photographs allowed, his court portrait had to be approved by the man himself. He complained that his nose was hooked. The Obama administration had hoped to try the five defendants in a civilian court in New York, but there was too much opposition to letting them on the mainland. Guantanamo appears to be the only option. But why now? Does it have anything to do with a presidential election? And given what's already been said, what are the chances of a fair trial? The five suspects are to hear their charges read out before a military court within 30 days, and are expected to be asked to enter a plea. The decision to refer the charges to a military commission comes after a lengthy legal wrangle over where the five men would face justice. In 2009 the Obama administration tried to move their trial into US civilian courts, but reversed its decision in April 2011 after widespread opposition. The five were eventually charged in June 2011 with offences similar to those they were accused of by the Bush administration. US President Barack Obama came into office in 2009 pledging to close Guantanamo Bay and try high-value terror suspects in US civilian courts. But he was forced to abandon the closure plans as it became apparent that the issue of where to imprison and try al-Qaeda suspects had no easy resolution. 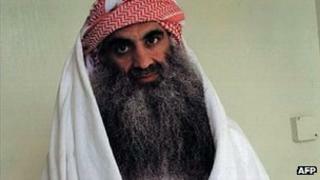 The Pentagon has previously said Khalid Sheikh Mohammed admitted he was responsible "from A to Z" for the 9/11 attacks. In a previous court hearing he has said that he intended to plead guilty and would welcome martyrdom. He was captured in Pakistan in March 2003 and has been detained at Guantanamo Bay since 2006. US prosecutors allege that he was involved with a host of other terrorist activities. These include the 2002 nightclub bombing in Bali, Indonesia, the 1993 World Trade Center bombing, the murder of American journalist Daniel Pearl and a failed 2001 attempt to blow up an airliner using a shoe bomb. Khalid Sheikh Mohammed has alleged that he was repeatedly tortured during his detention in Cuba. CIA documents confirm that he was subjected to simulated drowning, known as waterboarding, 183 times. Also facing trial are: Waleed bin Attash, a Yemeni; Ramzi Binalshibh, a Yemeni who allegedly helped find flight schools for the hijackers; Ali Abd al-Aziz Ali, accused of helping nine of the hijackers travel to the US; and Mustafa Ahmad al-Hawsawi, a Saudi, accused of helping set up the hijackers with money, clothes and credit cards.